For a true gardening enthusiast, there never seems to be enough open space available no matter where you live. However, only urban gardeners fully appreciate the challenges of gardening in small spaces. For every apartment dweller with a mere balcony or homeowner whose green space is limited to a rooftop deck, containers are a wonderful and practical way to indulge your green thumb. At Farmer’s Market, Chicago’s garden center, we offer an ever changing array of exquisite containers in various shapes and sizes to fit every style. Whether you’re searching for a stunning ceramic urn in a vibrant primary color, or your tastes run more toward a simple matte black container, we can help you find exactly what you want. If we don’t have what you’re looking for, just ask one of our sales associates— chances are we can order it! Perhaps you have a knack for putting the perfect container together with stunning results. However, if you are like many gardening enthusiasts, you have a picture in your mind, but are unsure of how to achieve it. 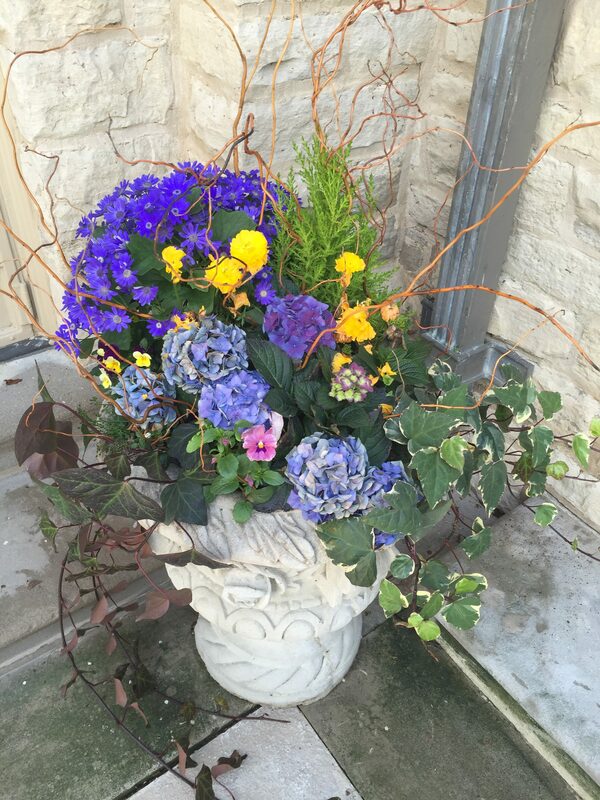 At Farmer’s Market, Chicago’s garden center, our design team specializes in creating innovative container designs based on your tastes and specifications. We also offer local delivery upon request. Maybe you have the perfect place for a gorgeous container, but aren’t sure what you want. When you visit our fully-stocked garden center in Chicago, you will most likely find something perfect for that empty space. Stop in and speak with one of our creative consultants, bring pictures of what you like, or simply browse our extensive selection and see what catches your eye. If you think you have no space to grow your own edibles, stop in and check out our earth boxes and other innovative products that make it simple to grow your own fresh greens and veggies in tight places. You don’t have to grow sweet corn and pole beans to enjoy freshly grown goodies—herbs grown on your kitchen windowsill make a great addition to any meal. Container gardening requires more than just a beautiful container. Once you select the perfect vessel, you will need to fill it up! At Farmer’s Market, Chicago’s garden center, we stock a variety of high-quality potting soils as well as many plants especially suitable for containers. We also offer a complete selection of fertilizers to help keep your plants flourishing throughout the season, right up until the first frost.